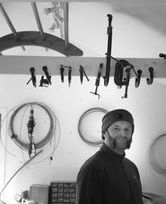 Mark’s forged contemporary sculptures are easily recognised and much admired. Gerry Jones studied at the Central School of Art & Design in the 1960's. He went on to set up and run a successful design group in London with colleague Bob Clift. In the 1980's Gerry and his family joined his brother in New Zealand where they designed, built and ran a leisure park for four years. Then, following a period of extensive travelling around the South Pacific, Gerry settled in Fiji where his lifelong interest in the natural world merged with the stunning scenery, wildlife and vibrant colours of everyday life. Rachael Long graduated in History of Modern Art BA (Hons) from Newcastle in 1990. An award-winning artist with many public commissions across the UK and private commissions from collectors in France, Austria, New Zealand and the US. Chris Mound lives and works on the Suffolk bank of the river Waveney in the middle of East Anglia. With a mixed history of creative endeavour, he started out studying Ceramics and then became seduced by textiles, particularly tapestry Weaving. Since 1997 Chris has been working in an environment where the focus is on helping other people to use their own creative abilities and in the course of this has found a particular satisfaction in the craft of woodcut printmaking as a means of expression. Tiny is an Artist Printmaker passionate about colour and exploring all different types of printing methods. Her prints are all hand-printed, limited editions so there will always be a slight difference in tone and colour. Inspired by subjects from nature and wild life you can sense an organic feeling in all of Tiny’s work. Terry Pastor is best known for his iconic album artwork for David Bowie's Hunky Dory and Ziggy Stardust. While it is his albums that usually grab the headlines, in reality this work is just one element of Terry Pastor's career. His credits include album covers for the Beach Boys, Alex Harvey, The Sweet, Carl Palmer, Soft Machine and many other artistes. Given the similarity between album covers and book covers, it is no surprise to find that Terry Pastor's credits include covers for best-selling authors like Arthur C Clark, Jeffrey Archer, Mickey Spillane, Colleen McCullough, Len Deighton, Brian Aldiss, Michael Crichton, Ed McBain and Leslie Thomas. Liz Pressly studied Fine Art under Lionel Bulmer at Kingston-on-Thames Art School, exhibiting early work at The Young Contemporaries Exhibition in London, where her work was bought by the Arts Council and shown at their 1960’s Recent Acquisitions show at the Tate. She left England in her twenties and circumnavigated the world in a sailing yacht, before returning to bring up a family and continue painting and sculpting. Liz has lived in Suffolk for 40 years. Tsvetelina Spiridonova was born March 23, 1976 in the city of Sofia in Bulgaria. She graduated from Art School "Ilia Petrov" and the National Fine Art Academy - Master in Printmaking under Professor Peter Chuklev.